During most of August and September our back yard is invaded by mosquitoes. We can only really go out there in twenty minute chunks before we are swarmed. So finally after a few chilly nights the mosquitoes are gone and the yard is ours again. We have been spending lots of time out there enjoying the nice fall weather. The other day we brought out a large roll of paper we had. At first we were just going to paint but then I rememberd seeing this on pinterest a long time ago. I have wanted to try something like it ever since I saw it so I pulled out our scooter and we started painting, the wheels! 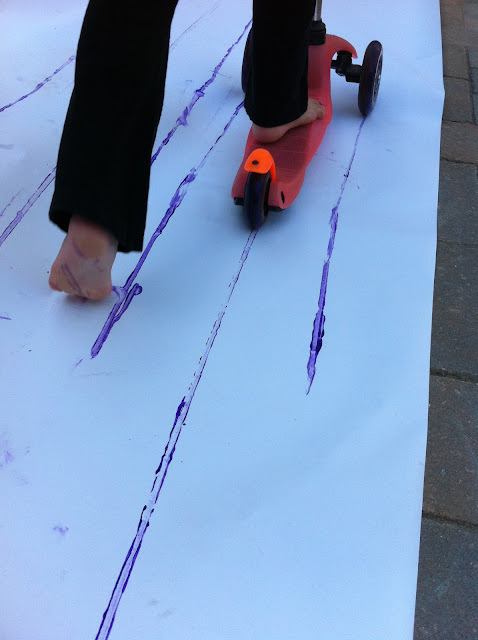 I used wahsable tempera paint and a sponge brush to coat each of the wheels on our scooter. I then rolled out a long stretch of paper and placed the scooter on one end of the paper. The Bee went first and rode down to the end of the paper. Both girls loved seeing the marks left behind the scooter. 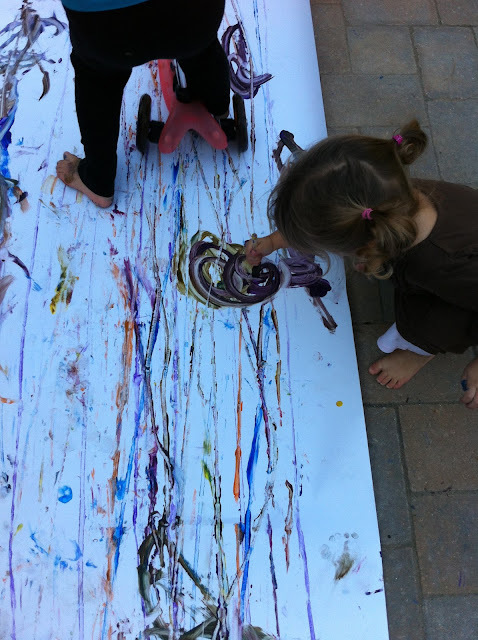 The Bean wasn't really interested in scooting, she was happy to paint along the paper with a brush. The Bee loved painting with the scooter. 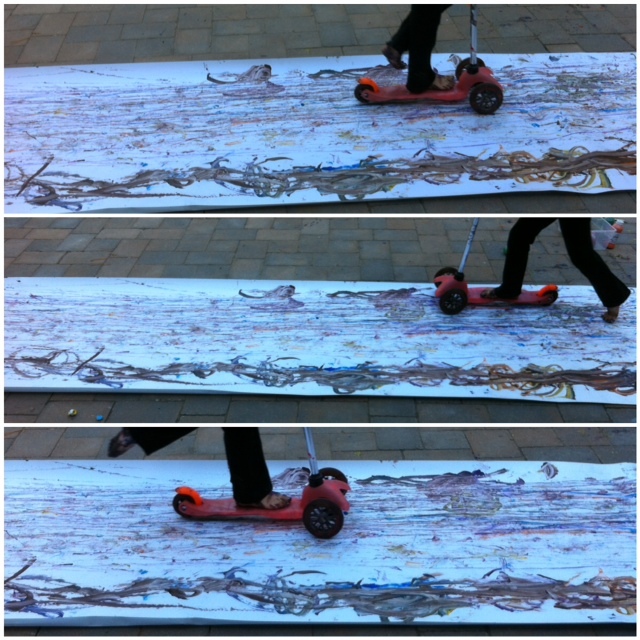 Every few trips she or I would add some more paint on the wheels and then she would ride off again. By the time she was finished the paper was covered in the paths she had taken. The finished painting was awesome. The whole process was pretty messy, see the below photo of the Bee's feet when she was finished. 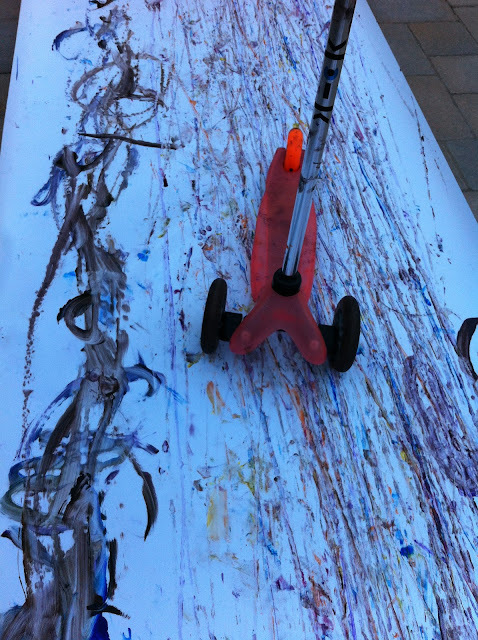 However, it was all washable paint so the clean-up wasn't too bad and well worth it for all the fun.